If you have always wondered what it would be like to be a blacksmith, you can attend an introductory workshop and try your hand at forging. If you wish to continue on, we would require you to join as a member. Our workshop structure at Penfield is geared toward getting you up to speed with the basics at your own pace. Don’t worry….we will take it slowly. With this in mind, we have arranged the first Saturday workshop of each month for new blacksmiths to have a tryout. 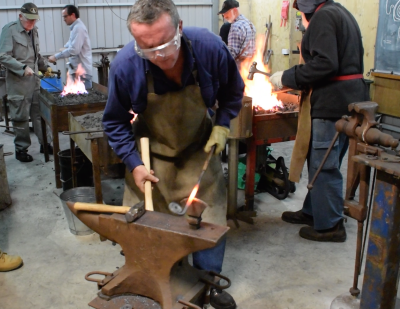 The whole session is dedicated to getting you accustomed to the fire, the tools and the basics of forging. We welcome anyone to come along and have a try. The cost is $10 for the day. Materials are extra. If you should require materials, we have a range of sizes at very competitive prices. Safety is paramount at the forge, and you will be required to have the correct safety equipment on the day. This will include :- Safety Eyewear, full cover cotton clothing, hearing protection, fully enclosed work shoes or boots and leather gloves. A leather apron is recommended as added protection. You will also need a hammer….most important. We recommend a 900-gram Engineers Ball Pein hammer fitted with a wooden handle to start off. The Association is run by a group of volunteers who have the shared aim of keeping the craft of Blacksmithing alive. The courses we conduct are to introduce participants to Blacksmithing and also the Association. The Courses are held at the ABASA Penfield Forge, located on the grounds of the Penfield Sports Association on Woomera Ave, Edinburgh. The Induction day is mandatory. The instructor will take you through the basics of Safety, Fire Management and Forge Protocol. Participants will be introduced to the tools and their uses and a bit of theory on the craft of Blacksmithing. A BBQ lunch is provided and soft drinks are available at a modest cost. Tea and Coffee is available free. If time permits the instructor will light a forge and demonstrate some basic skills of hammer control and anvil use. All persons attending either the course or workshop sessions must be dressed in full cover, non-flammable clothing. Eye protection and sturdy footwear are required. Hearing and hand protection are highly recommended. All tools will be available at the forge, You may wish to purchase some after discussion with the Instructor. The cost of the course is $300 (non-refundable unless we can fill the place, as payment is taken as a commitment to attend). This includes all materials as well as 3 months Full membership of ABASA commencing from the start of your course. This membership entitles you to attend Saturday workshops to practise your skills. The cost of Saturday workshops is $10. Plus, material costs, should you need to purchase additional stock to forge.